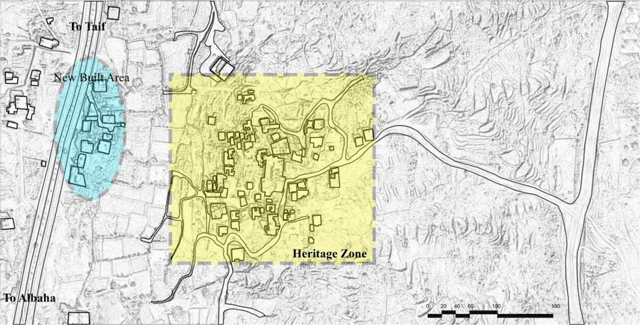 This paper investigates and analyses the redesigning of a heritage village in the southern region of Saudi Arabia to determine the impact of sustainable design strategies and green open spaces for the village rehabilitation. Heritage village development is an important step to consider for sustainable urban planning and design due to its influence in urban development, the local economy, and historical conservation. Al-Qahad heritage village has been selected as the case study due to its involvement with different historical domestic buildings, military castles, and mosques and its location on the main highway between Albaha and other regions. Furthermore, this heritage village reflects in its urban identity the local environment, social culture, and local construction materials and vernacular architecture. The applied approach involved visiting Al-Qahad heritage village for (a) analysis of the site and environmental conditions, (b) mobility survey analysis, and (c) the application of urban sustainable design strategies for redesigning Al-Qahad heritage village. The site visit included a physical survey to determine the current condition of buildings regarding heights, conditions, land use, and construction materials used. The output of the study is to redesign the heritage village including suggesting some other urban facilities, such as a museum, hotel, and other social activities to attract visitors and rehabilitate the village. The study highlights the importance of many urban sustainable design strategies that can be applied in other heritage villages in Saudi Arabia to protect and conserve the historical buildings and invest in these facilities for tourism purposes. Saudi Arabia is a nation rich with heritage villages, which are found across the country especially in the southern region. The study concludes by offering several recommendations for developers and investors. Sustainable urban and heritage development has become an important international concern. The United Nations Educational, Scientific, and Cultural Organisation (UNESCO) was established to manage heritage culture and maintain the World Heritage Site list (Arandelovic 2015, Duraj, Marschalko et al. 2016). It is well known that urban regeneration contains large scale demolition zones, which can result in the destruction of the local urban identity (Yung, Zhang et al. 2017). Yet, a clear understanding is required of the cultural tradition factors, and their influence in heritage conservation in urban regeneration must be taken into account. Developing heritage villages, including conserving historical facilities, is important if an area is to be considered a UNESCO site, as cultural heritage is of interest to the tourism industry (Cuccia, Guccio et al. 2016). This literature review chapter will summarise previous studies on the sustainability of built environments, including heritage development, conservation, and rehabilitation. Albaha region is one of the regions that have many heritage villages that require protection, conservation, and investment. Heritage villages reflect the local traditions, culture, and design based on local climatic conditions. As such, this paper will present an overview of the field of sustainable heritage development and urban design, and of the context of Saudi Arabia specifically. This heritage village needs considerable planning and urban design for its restoration, rehabilitation, and urban development. The established design strategies for planning, designing, and developing heritage villages in Albaha will be applied to this heritage village. The main approach of the study was to analyse the environmental perspective, including wind direction, local temperature, and the surrounding urban fabric. The design includes the suggested entrance and accessibility to and from the heritage village, a plan for removing some of the buildings in a poor condition that have lost their features and attributes, the new concept of the urban design of the village, the design for suggested land use, and the proposed construction materials to be used. The final land use presents the ultimate urban design for Al-Qahad heritage village with suggestions for some new recommended facilities for conserving and investing in this heritage village. 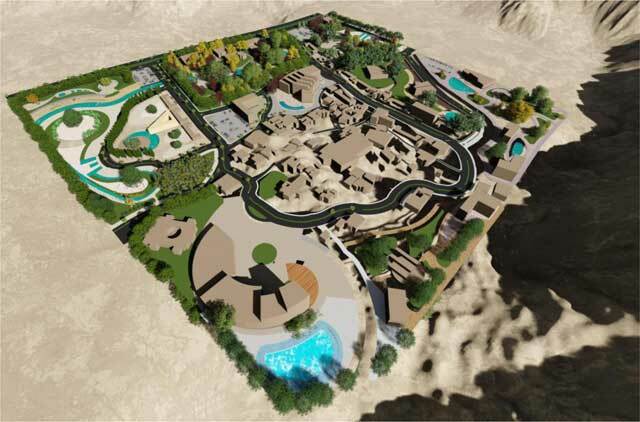 The output is to develop Al-Qahad heritage village. This stage confirms the flexibility of the application of the suggested design strategies and validates the established design strategies in this research. Due to the current features of Al-Qahad and its attributes, the concept of this heritage design has focused on six main dimensions: (a) related studies, (b) methodology, (c) case study location and description, (d) site visit survey, (e) concept and design, and (f) conclusion. Urban design has been become a profession that follows the purposes, aims, and determinations set out by the Global Conference for Cities’ Futures (Mersal 2016). City attributes and features, as well as beautification, were important targets of urban design at the time that it became a specific career and profession (Mersal 2016). 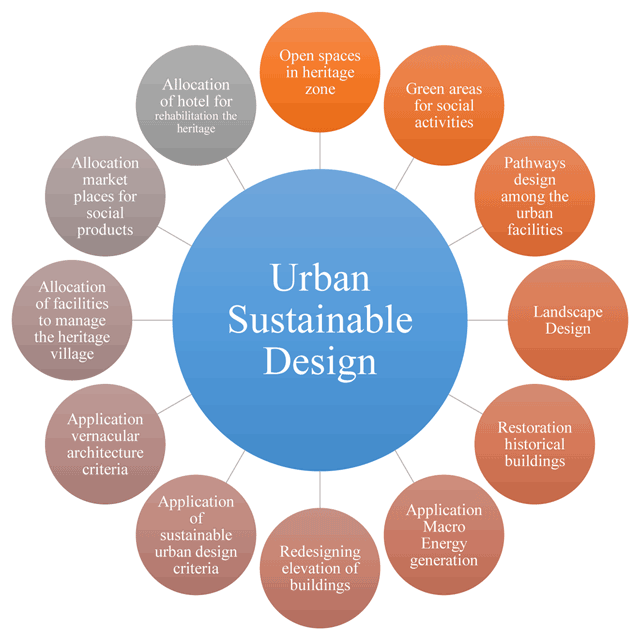 The scope and targets of urban design play a significant role in environmental design, and must take account of local culture (Mersal 2016) and climatic conditions. Heritage conservation is a multi-disciplinary field; it covers different subjects and issues, such as archaeology, environmental responsibility, architecture, and art (Zeayter and Mansour, Yung, Zhang et al. 2017). The concept of conservation has been studied by reviewing previous research and observing the original roots of conservation ideologies (Zeayter and Mansour). The authors examined four conceptual ideological approaches to conservation, namely, a socio-economic approach, urban planning approach, physical approach, and cultural approach. Theory in this field has progressed significantly since it began, especially between the early classical age to the new globalisation era, and highlights positive strategies to be applied for the protection and rehabilitation of a historical city (Zeayter and Mansour). The ideologies evaluate the material-based methods of protection, management, conservation, and rehabilitation that were adopted and applied in the early stages of the conservation movement in EU countries, and the later values-based methods that have been established and developed internationally. RQ1) What are the physical site conditions that prevent redesign and conservation of Al-Qahad heritage village? RQ2) What are the environmental and natural resources that can be employed in operating the heritage site naturally? RQ3) What is the best solution and design for Al-Qahad heritage village and how can the new design contribute local economy? To answer the above research questions, it is important to have multiple approach, as each question will need a specific research method. Hence, the methodology employed in this study is a mixed-methods approach that includes a site visit for Al-Qahad heritage village to highlight the current condition of development and redesign. The main goal to allocate the site visit approach is to identify the limitations and boundary of the heritage village, to determine the main access to and mobility of this heritage village and to illustrate the environmental resource of solar energy and annual rainwater and, finally, to redesign the heritage village. Due to the huge open spaces in and around the heritage village, a site visit was conducted to determine the boundary of the redesigning, as illustrated in Figure 3.1 below. Albaha is located in the southern regions of Saudi Arabia where tourism and agriculture (Al-Aklabi, Al-Khulaidi et al. 2016) are the best economical resources for investment (Figure 3.2). 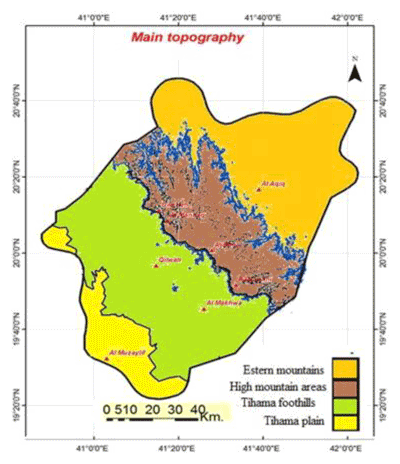 The topography of Albaha is characterised as mountainous and with cooler climatic conditions compared to the other hot climatic regions of Saudi Arabia. This climatic condition and the natural resources give the region an advantage for investing in agriculture and the tourism industry. Moreover, the social image and their urban identity in the built environment can be employed in both heritage conservation and the tourism industry that participate in the local economy. Al-Qahad heritage village is one of many heritage villages in Albaha region that have flexible access due to their location close to the Albaha highway, the large number of historical buildings and castles, and the availability of open spaces around the heritage village, which provides a further advantage of including additional facilities to invest in this heritage village. This heritage village reflects the image of many similar heritage villages across the region where the responsibility of local decision makers and developers is to invest in these heritage villages and in the tourism industry and to protect the urban and architectural identity. The heritage village contains many old buildings that were constructed using original local stone and two military castles. Moreover, there are huge open spaces around the heritage zone that can be included in the development of the heritage site and in support of other activities and rehabilitation facilities. The site location and its historical buildings give priority to develop Al-Qahad heritage village. In the bases of 73 historical buildings including two military castles within over 70000 m2. the development of this traditional and historical village will play a significant role in development local tourism industry as well as conserving these buildings. Hence; the applied approach for designing Al-Qahad heritage village can be display in Figure 3.3. Applied approach for designing Al-Qahad heritage village. A site visit survey and analysis were conducted to diagnose the current conditions of the heritage buildings in terms of the construction materials used; the restoration process, the urban design, and landscaping required; and the allocation of new facilities for the rehabilitation and operation of the village. To achieve the main goal of the study, the applied methodology has been divided into three main stages to cover (a) site analysis to investigate the topography of the site, wind direction, natural resources, availability of construction materials, and renewable energy and agriculture areas; (b) physical analysis to include the condition of each individual historical building, the type of construction masteries used, and the process needed for restoration of the buildings; and (c) sustainable urban design to cover a comprehensive urban design of the whole heritage village and include new facilities to rehabilitate the heritage village and meet the environmental requirements. Site analysis is a significant step that must be conducted prior to the design and construction process to determine the current challenges related to the site conditions and environmental resources (Huo, Yu et al. 2017, Sung and Park 2018). The site analysis was conducted to cover environmental analysis, site conditions, onsite renewable energy, and mobility analysis. This will contribute to the design concept to deal with the surrounding context of the site. The site analysis will be divided into three main sections: physical analysis, environmental analysis, and mobility analysis. Hence, the analysis will be categorised as physical site visit analysis, environmental analysis, mobility analysis, and physical analysis. The site visit and analysis were conducted in the first stage of the design of Al-Qahad heritage village. The purpose of the survey analysis is to consider the topography of the site, the challenges faced in the design process, the image of wind direction, and the availability of natural resources. This will show the designer how to employ the natural resources of wind and solar radiation when redesigning Al-Qahad. The details of the character of the location are reflected in Figure 4.1. It is apparent that there are two agricultural areas and farms along the village boundary. Furthermore, the site analysis at this stage highlights two agricultural areas with a levelling of the topography, as well as nearby buildings. Figure 4.1 illustrates the site analysis of Al-Qahad heritage village. Wind direction and its potential energy generation will be taken into account in designing the heritage village. The other natural resource such as; solar radiation will participate in operating the heritage village. Supporting facilities such as hotels, shops can contribute on attracting visitors and rehabilitate the heritage village during the seasons. These facilities can be allocated on the open space zones around the village that aiming to create activities in the village. Environmental analysis of Al-Qahad heritage village. Albaha region is one of the states characterized by cooler climatic conditions and natural resources. On this basis, Saudi Arabia in general and the southern region in particular are rich in natural resources, such as solar radiation and solar energy (Almarshoud 2016, AlYahya and Irfan 2016, Ramli, Twaha et al. 2017). Hence, the developer and decision makers must take an important step to exploit the natural resources in the local built environment. Since there is a huge opportunity to apply on-site renewable energy technologies, the availability of natural resources including temperature, humidity level, solar radiation, and wind energy in Albaha can be seen in Table 4.1 below (CDOS 2008). The table above illustrates how the availability of natural resources can be employed in the operation of the village. To protect the urban identity of the heritage village, it is not possible to apply the micro energy generation that reflects the industrial revolution, as it goes against the characteristic historical features. On the other hand, macro energy generation can be employed in the mountains surrounding the heritage village. These locations are suitable for generating wind energy and for providing energy in the form of electricity to support the energy demand for operating the heritage village. Furthermore, the newly built facilities in the heritage village can employ micro energy generation, such as photovoltaic (PV). These can be applied on the top of each building in Albaha and so generate electricity through solar radiation. As Albaha region is an agricultural area, the village contains some small farms within and around the heritage village. The used landscape design involved providing more green areas and trees that play a significant role in cooling strategies in summer (Sodoudi, Zhang et al. 2018). Environmentally; green area will contribute to minimise CO2 emission rate and increasing thermal comfort (Coccolo, Pearlmutter et al. 2018). Many benefits can be achieved through providing energy naturally, including exploiting natural and renewable energy, protecting the environment by minimizing the production of CO2 emission rates, and minimizing the burning of fossil fuel. Moreover, financial and economic benefits can be achieved by investing in natural energy to provide electricity to make financial, or in kind, payments to local communities (Kerr, Johnson et al. 2017). In the architecture market, it is essential to include natural resources in new project designs due to the trend in the global industry. With the current architecture market, the future deployment of renewable energy will necessarily be more costly and less scalable (Blazquez, Fuentes-Bracamontes et al. 2018). 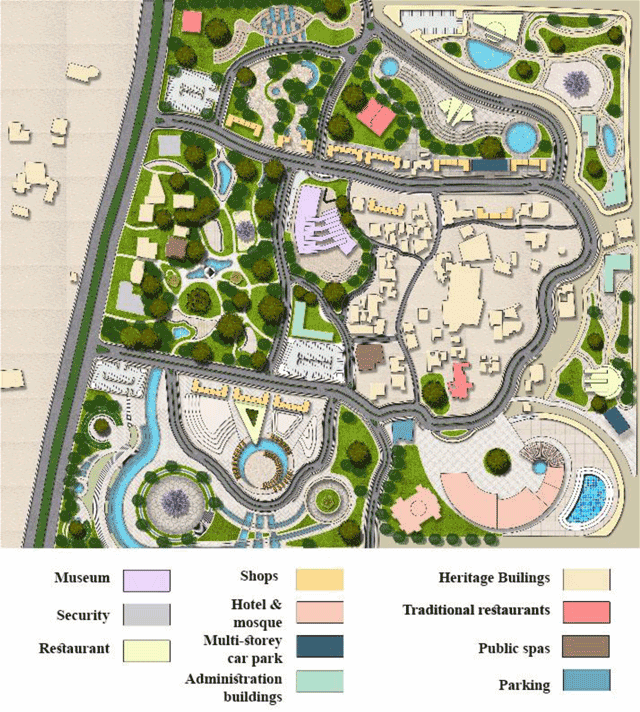 Transportation is an important factor in redesigning and rehabilitating a heritage village in Albaha by providing an efficient transportation link and methods from and to the heritage village that will provide flexibility for the public to visit the village (Rehman Khan, Qianli et al. 2017, Van Truong and Shimizu 2017). The location of the heritage village among the surrounded facilities is an important factor for its development. The transportation and mobility network and flexible access to and from the village is an essential element of the design that must be taken into account in redesigning and developing the village. Development of the network and mobility is from outside the heritage village with the main highway of Albaha and inside the heritage village to link the heritage facilities. During the site visit, it was observed that the village is isolated from the main highway, and it is difficult to access the historical buildings. Figure 4.1 below presents the location of the heritage village and analyses the access to the heritage zone. This figure shows an essential step to designing flexible access to the heritage village and designing internal roads and pathways among the heritage village facilities. One of the challenged faced in developing this heritage village is the absence of transportation planning for this heritage village. This is village is located by the main highway of Albaha and Taif where this is the only way to design main access as seen in Figure 3.1. Hence, the entrance and flexibility of transportation is one of the important factors in redesigning the heritage village. The physical site visit was conducted to determine the process needed for the development and redesign of the village. The focus was on the availability of open spaces within the heritage zone, which is the heart of the project, and the construction materials used for the historical buildings. Moreover, the visit survey focused on how to link the heritage zone with the urban mobility network and on how this heritage village can be rehabilitated and operated by allocating areas for new facilities. On this basis, the output of the site visit gives rise to a comprehensive restoration process for each individual building including comprehensive urban design for application of the urban sustainable and environmental criteria. The current condition of Al-Qahad heritage village is poor; each individual building is in a poor condition, including the castle and other urban facilities. There is a mixture of new concrete buildings that detract from the urban identity, and there is no exploitation of environmental resources, such as solar radiation and wind energy. Table 4.2 displays the number and total area of the heritage buildings. The design of the heritage village depends on its historical features and the use of original construction materials to reflect its vernacular architecture (Motealleh, Zolfaghari et al. 2018, Ortega, Vasconcelos et al. 2018). Therefore, applying the local identity is one of the most important issues to protect the heritage village’s features, conserve the local traditions, and investigate the village regarding historical tourism purposes. 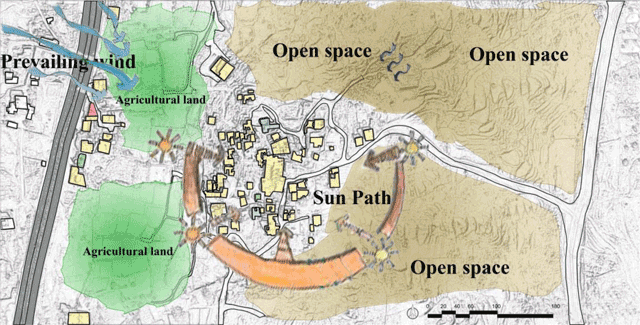 Furthermore, climatic conditions must be taken into account when designing the heritage village in order to employ the local natural resources, such as solar design, shading strategies (Ghosh and Neogi 2018, Luo, Li et al. 2018), and urban wind energy to provide efficient natural ventilation for the heritage village (Stathopoulos, Alrawashdeh et al. 2018). The design of Al-Qahad heritage village must take into account the local climatic conditions and the original urban and architectural identity. This represents a challenge for designers regarding how to deal with the public requirement in rehabilitating this heritage village and protecting the social legacies. Hence, designing Al-Qahad heritage village involves twelve main strategies, as illustrated in Figure 5.1 below. Applied design strategies and principals for Al-Qahad heritage village. The design process for Al-Qahad has taken into account the output of the site visit survey and analysis whilst considering the social structure and challenges within this location. Al-Qahad is located approximately 100 meters away from the main road linking the Albaha region with the southern region of the Kingdom of Saudi Arabia. In addition, it serves as the gateway to the Albaha region and reflects the urban architectural and historical identity of the region. The conceptual idea was to exploit the link between the heritage village and the main highway of Albaha and the southern region. Evidently, there is no direct link between the heritage village and the surrounding facilities, especially the main road; thus, this is one of the key design strategies for developing heritage villages in Albaha region. The design concept focused on exploiting the open spaces linking the heritage village to the main highway, and allocating facilities such as hotels and museums. Figure 5.2 represents the design concept for Al-Qahad heritage village. Regulations in construction industry are varying depending on the land use and its policy of the area. As the heritage village has its character and historical features, it needs special regulations taken into account the environmental responsibilities and local vernacular architecture. Hence, all building will be kept, protected and developed taken into account its original design and using local construction materials for conserving these historical buildings within the heritage and employing these traditions in tourism industry. Idea and design concept for Al-Qahad. Many factors and design strategies deal with the local environment and topographical characteristics. These factors will play a significant role in shaping the heritage village with the surrounded context (Table 5.1). Thus, these factors will be investigated regarding their influence and role in the rehabilitation, conservation, and redesign of the heritage village in Albaha region. Factors to be applied in redesigning Al-Qahad heritage village. Exploiting the internal open spaces for vitiation and green areas This can be occurring by designing efficient open spaces with application of trees distributions across the village. This step will participate in minimizing CO2 emission. Separating the parking area and facilities from the heritage zone This contributes to protection of the urban identity of heritage zone. Moreover, hotels, and other facilities must be new constructions outside the historical zone. Application of the vernacular architecture criteria in restoration the individual building This contributes to the development and restoration of the individual buildings in the historical zone. The original design and the same local construction materials should be used for reconstructing the destroyed buildings. Application of natural shading device strategies The use of sustainable criteria, such as shading devices, to present the lifestyle of the original culture in the past and contribute to natural coolness and providing ventilation. Employment of on-site renewable energy generation Heritages were built under the challenge of environment. The historical zone must not link to electricity grid. The PV panels and turbine can be applied in the mountains around the heritage and generate energy in form of electricity from solar radiation and wind. Application of natural ventilation in restoration the individual buildings National ventilation methods must be applied in restoration individual building in the heritage zone due to huge number of visitors and healthy purposes. Due to the huge open area within the heritage village boundary, it is essential to include these open spaces to attract visitors and investors. The heritage village must be multi use and include a historical zone, a shopping zone for traditional products, an open space area for social activities, and others. Four factors of employment have been applied in the open spaces and areas in the heritage development, as illustrated in Table 5.2 below. Factors of employment the open spaces and areas. Green areas This contributes to coolness and minimizing CO2 emission rate. Open spaces for social activities This contributes to rehabilitation and operation of the heritage village by local citizens. Open space for shopping traditions This contributes to presenting local and traditional products for visitors. Open space for construction new facilities Allocation of sites for new facilities for investors to rehabilitate the heritage village. Open spaces for constructing services of the heritage Allocation of locations for security services for managing the heritage village. Based on the design concept illustrated in Figure 5.2 below, it can be seen that many new facilities have been allocated, including hotels, museums, market places, and other services facilities. Following the site survey analysis and conceptual idea, the urban design of Al-Qahad can be seen in Figure 5.3. The allocation of museums and hotels within the heritage village will affect the operation of the heritage village during the summer season as well as throughout the year. The urban design has taken into account the design of pathways and the allocation of facilities to suit the requirements of tourism. Urban design of A-Qahad heritage village. The theory of urban conservation has changed significantly over the past fifty years (Salah Ouf 2001, Weckel and Wincorn 2016). Furthermore, the definition of human heritage and culture has changed and developed in order to protect the suburban areas as well as historical towns, including the character of the landscape, with the local community contributing social legacies and natural man-made artefacts. There are some difficulties to be faced regarding the practical development of the architecture, the urban history and design, and the archaeology, where each individual discipline concerns different areas and characteristics in relation to the conservation of human urban cultural heritage. Following the field of archaeology, urban rehabilitation and conservation is a key factor in the professional interests of people such as urban designers providing the local identity of urban planning and history to present an authentic urban identity (Salah Ouf 2001). The concept of urban sustainable design has focused on rehabilitation by adding facilities such as hotels, museums, and market places, restoring buildings that need refurbishment and restoration, and, in addition, redesigning the heritage village for a huge number of visitors and for tourism purposes. The location of Al-Qahad heritage village can be viewed as the gateway to the Albaha region and a landmark for the region due to it being located adjacent to the main highway that links Albaha with the other cities and regions in the south of Saudi Arabia. Several studies have confirmed the role of new urban design in heritage culture for economic and tourism purposes. Existing new constructed buildings need to be managed based on its current use. If residential, it is essential to change the building’s uses, to go with the village purposes. The new exiting buildings will be changed to be used as administrative buildings and security services with changing the features of the elevations and buildings’ mass as traditional buildings. Gospodini (2004) investigated the ways in which specific features and principles of urban morphology, including urban heritage and the urban design of space, contribute to the urban identity of cities in the EU (Gospodini 2004). Moreover, Gospodini (2004) confirmed that urban design and heritage help create landmarks, support tourism, and develop the economy (Gospodini 2004). The main urban design, after the creation of new facilities, is to create a focal attraction in the centre of the heritage village. This will include a main pathway and other walkways within the heritage village. The pathways have been designed to link the important facilities together and connect the external facilities and entrances. The recommendation was to build the pathways from local stone to reflect the historical environment. The distribution and planting of trees has been designed to take into account the sustainable and environmental requirements as well as the thermal comfort of the visitors. The Albaha region is characterized as having rain throughout the year. The creation of lakes within the heritage village would attract visitors as well as cooling the atmosphere. These factors and design principles have been recommended and demonstrated to develop Al-Qahad heritage village. The demolition of buildings has been taken into account in designing Al-Qahad heritage village. Figures 5.4, 5.5, 5.6, 5.7 illustrate the isometric plans of the final design of the heritage village. Strategies in relation to facilities have focused on development, rehabilitation, and investment in Al-Qahad heritage village. Hence, it is important to attract visitors to Al-Qahad by providing attractive facilities and flexible transportation to and from Al-Qahad. Firstly, transporting visitors to the heritage village via a special road and providing a spacious parking area around the village has been suggested. Isometric plan of Al-Qahad heritage village (Northern View). Isometric plan of Al-Qahad heritage village (Eastern View). Isometric plan of Al-Qahad heritage village (Southern View). Isometric plan of Al-Qahad heritage village (western View). Due to the low number of hotels around the region, one suggestion is to allocate a historical hotel with spa facilities and a marketplace. This hotel would contribute to attracting visitors due to its location close to the other tourism facilities of Albaha, and by its design and historical attributes. It is important to highlight that policies of pricing and competitive quotations are important to attract visitors to visit this historical place and to operate the heritage village. The suggestion is to build a new hotel in the centre of the heritage village, because the current historical buildings will not meet the needs of tourist, and they do not have the capacity to accommodate a large number of visitors. The architectural layout of this hotel will be in the region of 3,100 m2, to include at least 200 rooms and suites (Table 5.3). Facilities area in the project. This will contribute to investment in other facilities in the heritage village and increase the local economy, especially when other heritage villages have been developed using the same approach. The building space and design will be traditional and will reflect the local identity. Local stone has been selected as the main construction material. Stone itself is a sustainable construction material and suits the local environment of Albaha as well as reflecting the vernacular architecture and protecting the aesthetic view of the heritage village as a historical landscape. Figures 5.8, 5.9, 5.10, 5.11 display the section-elevation plan of the heritage village. Section of Al-Qahad heritage village. The other suggested facility is a museum, close to the hotel. Many historical artefacts have been protected by the local community, so it is important to include a museum in the heritage village to attract visitors to experience social legacies (Akbulut and Artvinli 2011, Stylianou-Lambert 2011, Dimache, Wondirad et al. 2017). The impact of museums in the development of the tourism industry and urbanism has been investigated with the scoping of the motivational constructs of tourists and the potential increasing importance of museums (Jansen-Verbeke and van Rekom 1996). Furthermore, for the tourism industry and its authorities, the motivation and behaviour of visitors to the museum offers interesting clues when investing in urban tourism products (Jansen-Verbeke and van Rekom 1996). Vernacular architecture results in a different generative dynamic and reflects the urban identity; thus, the construction materials used take into account the environmental conditions and challenges of the village becoming a field of scholarly study in its own right (Alves 2017, Plevoets and Sowińska-Heim 2018). Protecting and conserving the historical buildings within the heritage is one of the responsibilities in sustainable development and saves the local traditions for the future in ways that can be managed and invested in tourism purposes (Gravari-Barbas 2018, Su, Bramwell et al. 2018). The Albaha region is characterized as having its own unique environment compared with other regions of Saudi Arabia (Al-Robai, Mohamed et al. 2017, Groissböck and Pickl 2018). In general, a hot climatic environment is typical of Saudi Arabia, where shading strategies and efficient construction materials must be used for minimising heat transference. Hence, the restoration of individual buildings in Al-Qahad must incorporate efficient construction materials to provide a cool atmosphere for internal buildings whilst avoiding the use of any air conditioning technology so as to retain the historical identity. Stone is the most commonly used construction material in the heritage villages in Albaha due to its availability from the mountains in the region (Figure 5.12). Stone construction materials in Al-Qahad heritage village. As a construction material, stone is characterized as having a low level of thermal transmission that prevents heat passing from the external environment to the internal. As a building fabric, the stones from the local area are the most pristine materials that can be selected for a variety of purposes, that is, to achieve thermal efficiency and to reflect the local environment (Kumar 2015, Perini and Rosasco 2016). A doubting stone with a low level of U-value in the external envelope of a building plays a significant role in keeping the atmosphere cool, as confirmed by many previous studies (Fokaides and Kalogirou 2011, Latif, Tucker et al. 2016). According to Aste, Angelotti et al. (2009), energy-conscious building design consists of monitoring the thermal transference of the external building fabric. Moreover, they highlighted that previous studies have confirmed very different measurements regarding the potential energy conservation that can be achieved with the use of an adequate inertia exceeding 80% (Aste, Angelotti et al. 2009). The Albaha region consists of very old stone used as a construction material, with different shapes and characteristics. It is important to use a similar type of construction material to mask any human modification. This will protect the historical identity of the village and meet the environmental and sustainable principles. Moreover, the vernacular architecture of Albaha has its own identity, including using local construction elements to minimize CO2 emission rates in the construction process. The local community designed their urban and architectural identities according to their traditions and their culture (Zhai and Previtali 2010, Hwang 2014). Moreover, the vernacular architecture reflects the local climatic conditions, incorporating technologies normally adopted to mitigate local climatic conditions (Zhai and Previtali 2010, Ortega, Vasconcelos et al. 2018). On the other hand, the implementation of shading device strategies has been suggested in the restoration process of Al-Qahad heritage village. Shading devices include providing and planting trees within the heritage village, which will provide natural coolness and minimize CO2 emissions. Providing external coolness will protect the internal coolness of historical buildings in Al-Qahad. Furthermore, Al-Qahad will need energy in the form of electricity to provide energy and operate the facilities. Natural resources, such as solar radiation and wind energy, will play a significant role in providing clean energy without burning fossil fuels. The facilities have an historical identity, which does not involve new technologies. Providing solar energy through a photovoltaic PV system will affect the historical identity. Hence, the generation of energy using wind power is the best solution by implementing wind turbines on top of the mountains around Al-Qahad heritage village. The output of energy in the form of electricity can be used to operate the important facilities at the exclusive hotel and the museum. Invest in the close heritage village by establishing new hotels and market places to create abreaction points within the heritage villages that support the local tourism industry. Create a flexible mobility transportation system between the developed heritage village in order to support each other in participation in the tourism industry and to conserve the urban and architectural buildings. Involve the local citizens in rehabilitating heritage villages in Albaha. Involve specialist engineering consultants in developing heritage villages based on the suggested design strategies for conserving heritage villages in Albaha. 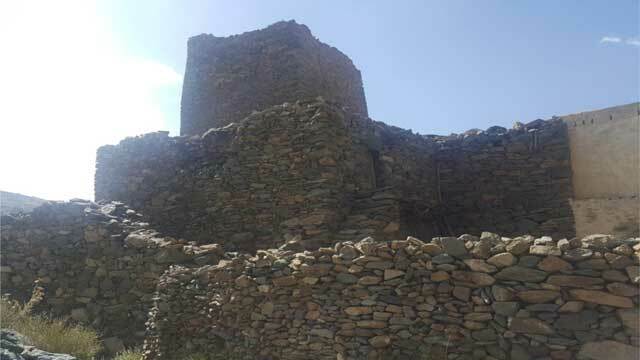 Establish specialised construction companies to manage and conserve heritage villages in Albaha. Employ the HBIM approach in operating heritage villages in Albaha. Cooperate with construction and built environment schools at universities to include and develop heritage conservation curricula. Establish construction companies to produce local stone bricks used in the construction industry in Albaha to minimise embodied energy. CDOS, C.d.o.s.i.S.A. 2008. “Central department of ststics & information in Saudi Arabia, environmental statics.” Retrieved 15th July 2012, from: http://www.cdsi.gov.sa/geostat/env/cat_view/40---/134--/154--. Kumar, PA. 2015. “Overview of Natural Stones as an Energy Efficient and Climate Responsive Material Choice for Green Buildings”. Implementing Campus Greening Initiatives, 27–35. Springer. Zeayter, H and Mansour, AMH. “Heritage conservation ideologies analysis – Historic urban Landscape approach for a Mediterranean historic city case study.” HBRC Journal.